However, when using a spectrum analyzer to search for unknown signals which may pose a threat, mobility is another very important factor to consider. When doing a security survey, it is vital to be able to quickly pick up the spectrum analyzer and walk around an environment to compare RF signal strength in different locations. Figure A illustrates traces being captured in three different locations relative to a transmitting signal. Figure B depicts those signals captured on the OSCOR. Trace 3 shows the strongest RSSI and the approximate location of the transmitter. 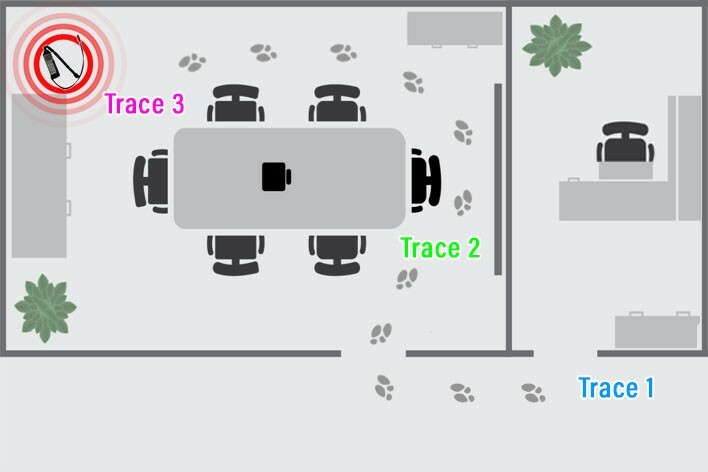 In order to narrow down the location of a transmitter, mobility is essential. The great benefit of changing locations is based on the physics of transmitting RF energy and locating the source of that energy. Because of the expanding radiation pattern, energy levels being transmitted from a single source will decrease based on the inverse square law. This means that energy level decreases as a function of the range squared from the source of the transmission. Therefore, when comparing RF energy 20 feet from a target versus one foot from the target, the power level of the shortest distance increases by a factor of 400 (or 26 dB). By simply walking around, you can increase the sensitivity of your search by a very large factor. 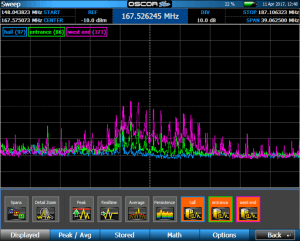 It is worth commenting on many of the new SDR approaches to spectrum analyzers. 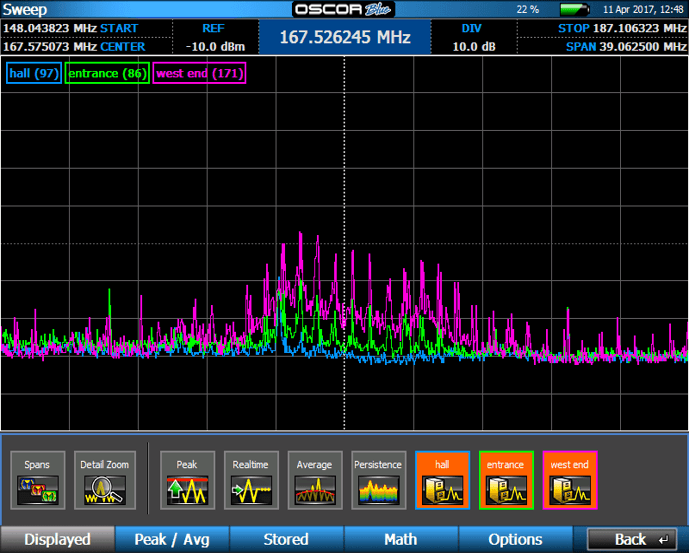 In an SDR system, a laptop is used to control a stand-alone tuner module (or other spectrum analyzer, antennas). An SDR system creates a real mobility issue because it is very difficult to simply carry the various components of the system which may include a PC, a tuner, one or more antennas, an antenna controller, and possibly an external A/D digitizer and processor. These types of systems may prove useful for an in-place monitoring system, but they are not userfriendly when searching a building for a specific RF signal. When comparing a spectrum analyzers for security purposes, REI recommends the following test: hold the spectrum analyzer in question in your hands, and walk around for at least 25 minutes while taking RF measurements throughout your facility. Try this with different units. Regardless of specifications, you will definitely have a favorite system when this test is completed!